This Bi-Function High Intensity Discharge (HID) Headlamp kit is one of the latest products from XSighting Systems. XSighting Systems is the aftermarket channel of Valeo Sylvania, a well known company specialising in high performance lighting. 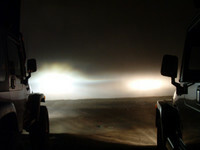 The lights were installed on a 2001 Jeep Wrangler Sport and literally, the difference is night and day! 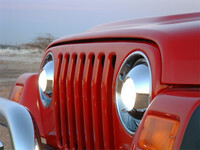 HID Lights are very different from Halogen Filament bulbs fitted standard on most vehicles, including the Wrangler. Rather than passing the current through a resistance wire and heating it to give off light, HID's use an arc of current to give off light. In a way, it's controlling lightning! Apart from just being brighter, this difference in technology makes the lights last longer too. Filament lights use a thin piece of wire and by passing current through it, heat it so much that it gives off light. Filament bulbs stop working when the filament breaks and the circuit is incomplete. HID lights don't have this problem because they use an Arc of light, there is no wire between the two terminals that could break! 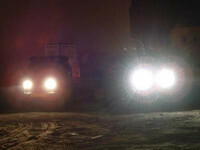 When going off road, Filament lights are at greater risk than HID's because the wire is weaker when hot. These lights have already been down trails with washboard surfaces, pot holes and axle twisters and despite breaking one shock absorber on the trip, the lights still work perfectly! How well do they work? Incredibly well! The output from these lights is at least 3 times greater intensity than the stock lights, much whiter light, and a very smooth, wide pattern. They certainly "feel" a lot more than "3 times brighter" and are a joy to drive with, both on and off road. Many new luxury vehicles now feature HID lighting including Porsche, Mercedes, BMW and many of the exotic sports cars. It only takes 30 seconds on the road to see why! You'll even have people asking "Is that newest Jeep? The ones I've seen so far don't have those lights!" Apart from the obvious looks difference, what seperates this kit from others for the Jeep is the "Bi-Function" feature. These lights are HID for both high beam and low beam. This is done using a single HID unit and a moving shield as the cut off for low beam. When you use high beams, the shield is moved out of the way and you really do light up the road or trail! Other HID kits on the market are only HID for low beam, and use a conventional Halogen light for high beam. Having HID on high beam is a REALLY nice feature for long poorly lit roads. However, there is one very small drawback to this. The problem is if you have to flash them to signal another driver who is already below the cut-off line (i.e. you are not on flat ground), they won't notice you flashing. They already are in the full force of the lights. The times you would actually need to do this are quite rare howerver. But that aside, the performance of these lights is simply awesome. I will never go back. There are many reading this that I'm sure will find it hard to justify US$350 per light ($700 total) but let me put it this way... Many people have a lot more than that invested in their suspension and wheels, and only go off road on the weekends or maybe just once a month... but many of us drive at night almost every day of the year! If your Jeep is your daily driver as well as weekend warrior, you will love these. They also put out great light off road The width of the beam pattern really helps negotiating around obstacles. The terrain in the Middle East is fine for adding extra lights to the vehicle - there's rarely trees that will hit them - but light bars (roof level mounted lights) can only be used when there's nobody in front of you. The HID kit puts out incredible light that meets United States Department of Traffic requirements (meaning Street Legal) and leaves nothing to be ripped off by low branches. If you do encounter branches or stone chips on the front lens, the front part is actually sacrificial. The real projector lens is behind a simple clear shield, so if you do get any damage it will be a cheap and easy repair - a very well thought out design. A larger protection grill is in the design stage. The Jeep Wrangler is not the only vehicle these lights will fit. So long as there is physical space to fit them, they should fit in any vehicle that came with 7" round headlamps. They are sold individually and even fit the Harley Davidson motorbikes! OK - enough talk - here's some comparison pictures! 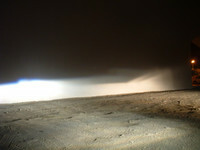 These photos are taken with a second Jeep Wrangler TJ equipped with Hella H4 housings (Stock on Middle-East spec Jeeps). You can also take a look at just what was involved in Installing the HID Headlights. Would I do it again? Definitely!